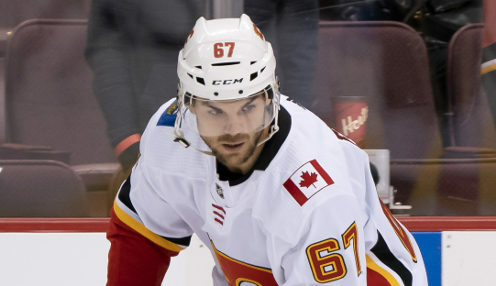 The Calgary Flames are back on the ice on Saturday against the Jets in Winnipeg after defeating the New York Rangers 5-1 at the Scotiabank Saddledome on Friday evening. Matthew Tkachuk had two goals and three assists for the hosts as they completed the season sweep over the rebuilding Rangers. Johnny Gaudreau, Garnet Hathaway and Michael Frolik were also on target for the Flames who have reclaimed the lead in the Pacific Division over the San Jose Sharks with 11 games left to play in the regular campaign. There's a lot more than just a Division title to play for between the Flames and the Sharks with the winner almost certainly taking on the Arizona Coyotes or the Minnesota Wild while second place in the Pacific should see a match up against the Vegas Golden Knights. On paper, a vastly different proposition even if the Golden Knights are not playing at the level of last year's Cinderella squad. Calgary returns home on Tuesday to open a two-game home stand against the Columbus Blue Jackets and the Ottawa Senators. The Blue Jackets are in the thick of the Eastern Conference playoff chase as they battle for a Wild Card with the Carolina Hurricanes and the Montreal Canadiens. The late season visit to California still looms large for the Flames who will take on the Sharks one final time in the regular campaign on the last day of the month before heading to Southern California to play the Los Angeles Kings and the Anaheim Ducks. The Flames are 5000/1 to win the Stanley Cup with Tampa Bay Lightning 12/1 and the San Jose Sharks 11/2.